Overall, Primal Pictures first attempt at an iPad app is an admirable effort with numerous positive features. The addition of certain features such as neurovascular anatomy and muscle innervation would help improve the utility of this app for medical professionals. 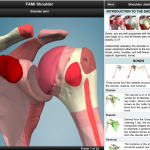 Despite this, this app still has substantial uses for medical students and physiotherapists looking to develop their understanding of upper limb and shoulder anatomy.